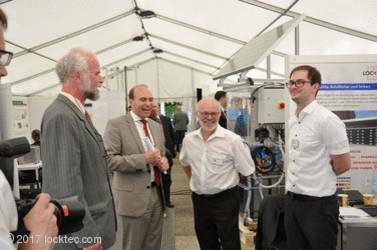 The Federal Ministry of Economics and Energy (BMWi) invited SITEC GmbH to present its cool lockers in Berlin on 18th May 2017, as part of the SME Innovation Day BMWi sponsored the cool lockers, which are marketed by subsidiary LockTec GmbH (www.locktec.com), and are already in operation worldwide, e.g. at butchers' shops, supermarkets or food retailers. 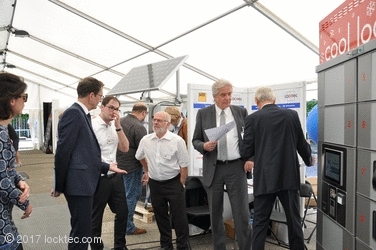 More than 1800 visitors at the Innovation Day learned about the world innovations of small and medium-sized enterprises. Members of the Bundestag were also delighted by high tech developments with the "made in Germany" quality seal. MdB Florian Oßner (left) tests the cool lockers and is pleased to get a chilled drink (with the MD of SITEC, Olaf Clausen, on the right of the photo).